In an area blessed with large mature trees there exists the danger of lightning strikes to your beautiful and valuable heritage trees. 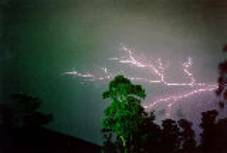 When lightning strikes it is often not only the tree that is endangered but also the people and the property close by. Lightning protection for trees has been available since the 1800s and yet many people do not realize how effective it can be. A well-considered lightning protection strategy can help to minimize the risk of strikes and greatly reduce the danger to property or of life threatening injury.